Have you been ripped off by a cowboy tradesmen or a rogue builder? 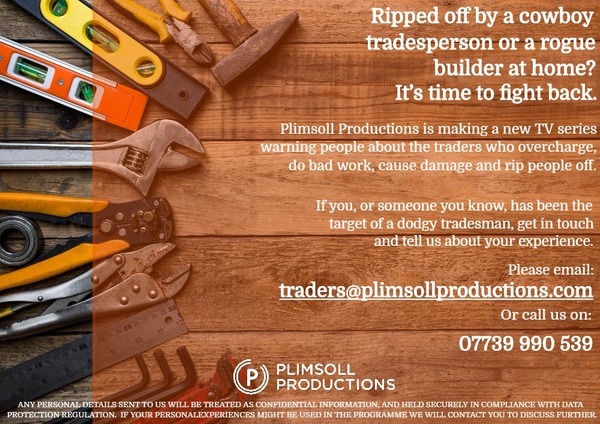 Plimsoll Productions is making a new TV series warning people about the traders who overcharge, do bad work, cause damage, and rip people off. Each year there are an estimated 170,000 doorstep scam attempts by rogue traders, costing us as much as £790 million. And the vast majority affected are the over 65s, a whopping 85% of them. That’s 395 pensioners every day. If you or someone you know, has been the target of a bad tradesman or scammer we’d like to hear from you. You have not left an email address so how can one get in contact? I have no desire to put my woes here for public viewing. Hi Charleygirl, the contact details are on the flyer attached, sorry for not being clearer.